Wichita’s free downtown trolley service has a new route as of December 15, 2018. The Q-line Trolley service in Wichita has been and still will be a great FREE way to get around downtown. 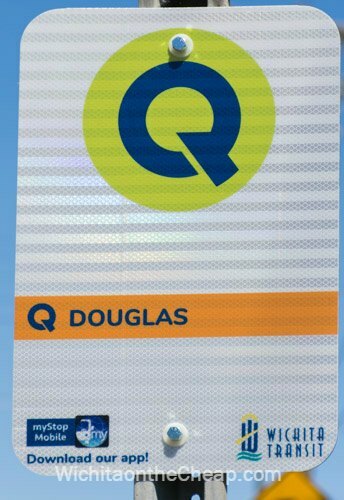 The new Q-line route will be simplified, only running along Douglas Avenue, but officials say that they will actually serve more than 5,000 additional people by extending the route all the way to Seneca (every day of the week) and to Edgemoor (on some days), and adding hours of service. They said the other, discontinued routes, which included Old Town and the Government Center routes, were underutilized. This new Q-line Trolley schedule will begin December 15, 2018. You’ll be able to ride all the way from Seneca to Edgemoor along Douglas from 10 a.m. to 1 a.m.
Again, the Q-line is still FREE. The current Q-line trolley offers routes in Old Town and the Government District as well as along Douglas. The routes are color-coded and operate at different hours. We’ve left this old/existing route information at the bottom of the article in case you want to ride the trolley before the routes and schedules change on December 15. The color-coding still exists in the new trolley routes, but everything is much simpler. When does the Wichita Q-line Trolley run? The Q-line Trolley hours vary depending on the day and time of day, but trolley service is offered in Wichita every day except for Sunday. Schedule: Monday through Friday, 11:30 a.m. to 2 p.m. Schedule: Monday through Thursday, 5 p.m. to 11 p.m. Schedule: Friday night from 5 p.m. to 1 a.m. and Saturday from 10 a.m. to 1 a.m.
See the current Q-line routes below. The signs are color-coded, so you’ll know which Q route stops there. Trolley stops are located about every other block along the trolley routes. Second, you’ll wait for a trolley to come around. The trolleys run approximately every 10 minutes during open hours (see the lunchtime, weeknight and Friday/Saturday schedules given above). If you’re in the right place you shouldn’t have to wait much longer than 10 minutes to catch a trolley. Third, when the trolley arrives, use “elevator etiquette,” i.e. wait for riders to exit before you get on. Finally, when you’re about a block away from your destination, pull the cord along the window of the trolley to indicate to the driver that you want to stop. How much does the Q-line Trolley cost? It is FREE. Zero dollars. Costs nothing! I think riding the Q-line Trolley (for free!) would make a fun Saturday morning or afternoon thing to do visiting the shops and restaurants along the route covered by the trolley, so you’d always have something fun to do! The free myStop mobile app available for iOS (Apple) or for Android devices is a real-time bus locator and includes Wichita’s Q-line Trolleys. Visit the website for more information about Wichita Transit services. Is there a way to see the routes if you don’t have a smart phone and can’t download an app?